There’s something special about Mexican candy; the unusual flavors, the brightly colored packaging, and the nostalgia behind the sweets come together to form something unique. 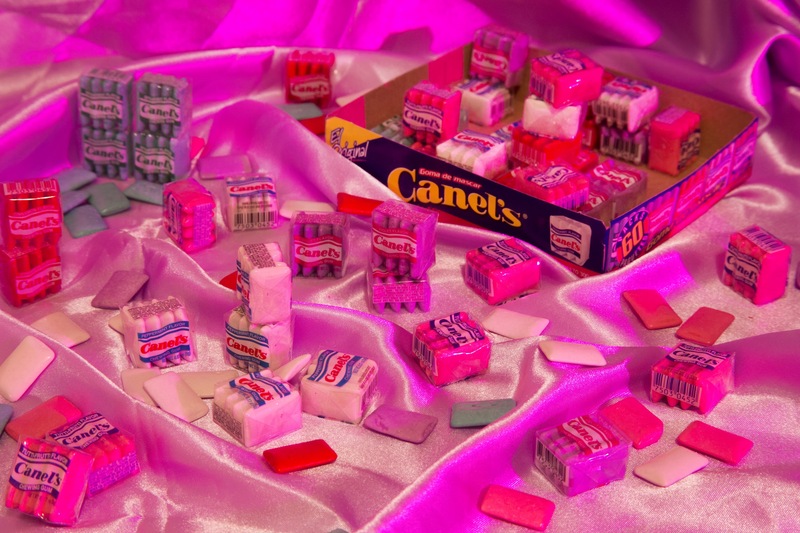 For multidisciplinary artist Ambar Navarro, however, these candies are more than just sweets — they’re also her muse. Inspired by miniatures, Mexican culture, and candy, Ambar created a shrine to honor some of her favorite Mexican treats. We talked to the artist about her inspiration, how her background influences her art, her favorite candy, and about what she has coming up next. HelloGiggles (HG): You have an extensive background in film and photography. How did you get started with these mediums? Ambar Navarro (AN): I actually went to film school, but watching movies is something that’s been a huge part of my life since before I can remember. I remember going to Blockbuster every single day for a summer; I even rented out the entire horror movie section at one point. I started playing with making stop-motion films at home with a digital camera and some small Christmas ornaments I had lying around the house one winter. That really helped me incorporate film and photography into one medium, and also spurred my love of all things tiny! HG: What inspired you to make a shrine to Mexican candy? AN: All of my shrines are super nostalgic and, in this case, I wanted to pay tribute to my mom and to some of the candies I remembered eating as a kid when we would visit Mexico. I spend a lot of time at the Piñata District in L.A. and felt like this could be a never-ending project with the amount of sweets that are part of Mexican culture. I love all the tiny details and even smells that come from them. I am obsessed with Duvalin candy cream packages and the cute, tiny plastic spoons they come with! HG: Do you have a favorite Mexican candy? AN: Honestly, I can’t eat much of these candies now! I used to be really into the Lucas crazy hair bottles with the tiny baseball cap that you would push for little streams of hair. I’m a bit more health-conscious now and can’t eat the artificial flavoring. With that being said, I’m more of a pastry/cookie/ice cream type of person. HG: How does your Latinx background influence and inspire your work? AN: At first, I didn’t even realize it was influencing my work until people started pointing out how Mexican it looked. I tend to use the same colorful palette you would find in the buildings of Mexico. I also use fun party props like balloons and other objects I’m naturally attracted to. Even visiting Mexico and seeing the man selling balloons on the street corner has seeped into my work, in one way or another. Now, I’m trying to be more conscientious about it as I make work that is even more political. It’s important for me to make fun work based on the political state we are in, work that still talks about the wall and everything that has happened with ICE. I really just want to show off how fun and amazing Mexican culture is, and I think it’s super important to showcase Mexican artists in bigger settings, especially since we’re so affected by the political climate. HG: How would you describe your aesthetic or style? AN: Glittery, shiny, shimmery, nostalgic, but still modern. I’m not necessarily trying to make anything look dated and still want my art to feel true to who I currently am. I also like using glitter and toys that are associated as craft materials to elevate it to a higher art setting. I’m a very obsessive and detailed person, so I think that comes through my work with controlling everything from the light, to the wrinkles of the satin, to the miniatures I select; everything has a purpose. HG: What do you hope people feel when they see these shrines? AN: I really want a sense of relatability within the Latinx community. I also want to give someone a moment of joy or nostalgia after they see one of these shrines. I don’t necessarily make work ONLY for the Latinx community. Other cultures could also relate to their own version of the sweets, as well as feel curious about trying some of these candies out. I really like looking up the history of these candies as well as watching old ’80s-’90s commercials! Like this super creepy one for the Paleta Payaso! AN: More films and photoshoots! I have a few music videos coming out at the end of the year and some photoshoots of musicians that will be in printed magazines. I recently shot Neon Indian and HANA, and I’m so excited about it! I’d also love to shoot a narrative film with animation in Mexico City, and would love to find some sort of grant to help fund that. That has been a goal for years. And also, selling more prints in a shop! To see more of Ambar’s work, you can follow her on Instagram or check out her website. You can also visit her store.